While I'm visiting your site, I will be saving the images (with two cameras) of every detected issue within your home or facility. My infrared camera will be utilized for detecting your concealed issues and the other camera will be my digital camera (if an IR report is requested), which allows me to illustrate the real time digital images alongside your infrared images. While I'm performing your infrared inspection, you are absolutely welcome to walk alongside me and view some amazing images on my infrared camera screen. Keep in mind that the size and clarity of these IR images (on my camera screen) may appear somewhat obscure to the untrained eye, but once it's formatted into a professional IR report, you'll have a complete understanding as to what's actually going on. Once I've completed saving all the necessary images to both cameras, I will then be taking these "saved" images to my office in order to upload them to my computer which contains specially designed software (from FLIR) that allows me to fine tune every little detail in these IR images. I will then transfer these finely tuned images to another software package that allows me to present your infrared images and your digital photos in a side-by-side photo comparison format. This type of systematic reporting allows you to view both, the real time digital photos alongside the thermal images of all the areas of concern. Once I have completed your IR report at my office (which averages about 2 hours), I will be emailing your report (in .PDF format) to the email address of your choice. 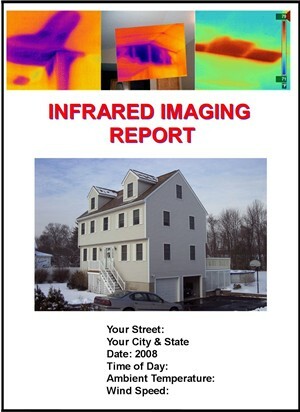 You will then have the ability to print this IR report from your very own printer or I can email this IR report to your local commercial printer (in your area) for your pick-up at your convenience. There will be no confusion in comprehending my easy-to-understand report. Your IR report will include all full-sized wide angle infrared images of all issues of concern alongside the high resolution digital photos. This type of format allows everyone reading my infrared report to fully understand the exact location of any concealed issues in question. Directly under these side-by-side images, you will find my professional interpretations of what is actually going on behind particular surfaces of your home. At the conclusion of your IR report, you will see my "Closing Comments". These comments are going to be my professional recommendations as to what should be performed in order to rectify the issues that were detected with infrared imaging. If you have any questions whatsoever, after reading my thermal imaging report, please CONTACT ME at your convenience. "Click the report (below) to view my sample IR Report"